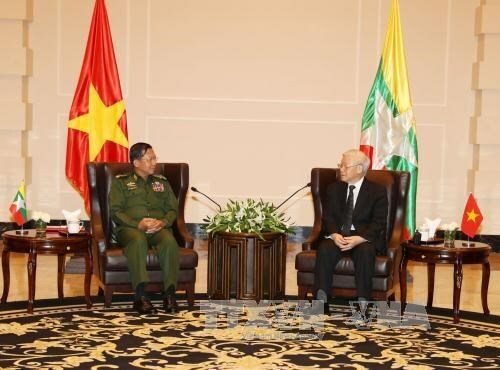 Naypyidaw (VNA) – Party General Secretary Nguyen Phu Trong said he wants stronger defence cooperation with Myanmar during a reception for Commander-in-Chief of the Defence Services of Myanmar, Sen. Gen. Min Aung Hlaing in Naypyidaw on August 25. The Party chief, who is on a State visit to Myanmar, said the two nations are close neighbours in the Southeast Asia and share many similarities in history and cultural traditions as well as common interests. Their potential and strengths are also complementary, according to the Party leader. He noted that the Vietnam – Myanmar relations have continuously been consolidated by the two nations’ leaders, particularly since the establishment of diplomatic ties in May, 1975. General Secretary Trong lauded the cooperation between the two Defence Ministries and armies, particularly after the signing of the agreement on defence cooperation in 2011, adding that Sen. Gen. Min Aung Hlaing’s official visit to Vietnam in March this year had opened up numerous contents for bilateral cooperation in training, military medicine and defence industry. He expressed his hope that the cooperation between the armies and military forces of the two countries will further grow, contributing actively and effectively to bilateral relations in line with the spirit of the Comprehensive Cooperative Partnership freshly established during the Vietnamese Party leader’s ongoing visit to Myanmar. For his part, Commander-in-Chief Min Aung Hlaing briefed General Secretary Trong on the cooperation between the two nations’ armies, and shared the evaluations of the Party leader on the cooperation between the two Defence Ministries over the past years.